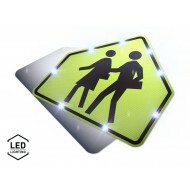 Blinking LED Traffic Signs are solar powered and run 24 hours per day. You have a choice of various sizes which include 24", 30", 36" and 48" (60cm, 75cm, 90cm, 120cm). 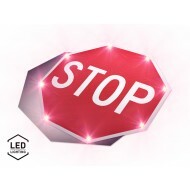 The current models of signs featuring LED pulse lighting are the LED Speed Limit, LED Stop Sign, LED Pedestrian Crossing, and LED School Zone Sign. 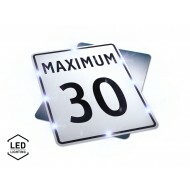 These signs meet all applicable Canadian specifications and are manufactured using the highest grade of reflectivity available, Type XI Retroreflective Sheeting know as '3M Diamond Grade Cubed or Avery OmniCube'. If you have any questions regarding specific Canadian transportation regulations, especially in western provinces of BC, Alberta, Saskatchewan or Manitoba, please feel free to contact a traffic safety expert at 1-844-289-7446. 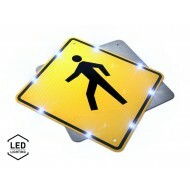 Sign Size(s) 24", 30", 36", 48" Light Size 1..
Sign Size(s) 24", 30", 36" Light Size 1 1/4"..
Sign Size(s) 30", 36" Light Size 1 1/4" Whit..
Sign Size(s) 18"x24", 24"x30", 30"x36", 36"x48" Light ..